Do you have right select enabled @jimpaw80? Perhaps as Dheim mentioned, the issue could stem from the fact that we are using left click to select. And if so, I’m wondering if left-click support is something you guys will consider, especially with Blender defaulting to left-click select. I select with left. can i share my screen on Skype? Maybe we can compare? I’m unavailable for skype at the moment, but perhaps @Dheim can chime in. BTW have you tried to change deom “select mouse” to left or right? i mean clicking on that box inside smart select preferences? I was able to install the add-on by switching my keymaps to Blender and switching back to my personal keymaps. @Dheim. I’ve yet to test if it works, but will report back in a bit. @jimpaw it’s working, but for me smart select seems to be selecting behind a face as well, creating unwanted selections and unpredictable usage of the addon. Yeah i am so glad you mentioned that aswell it seems to select “throught” the model right? Yes. so a double select triggers a weird struggle among loop selection of two different faces and flat selection. yeah it seems that right now the loop select get’s to much power, way to ofter it takes over. Weird, I still can’t make this bug show up. Do you and @Colacuve mind uploading the userpref.blend file being used when the error appears? Another option might be Exporting your Keymap settings. Blender will save them as a “.py” file. The selecting behavior in Blender was rewritten with the move from Blender Internal to EEVEE and changed something. I’m aware of the issue, but haven’t found a solution yet. Hi JimPaw80 and nBurn . I’ve just installed the recent beta version. I’m running Blender 2.8 beta daily build from 02Feb2018 on Windows 10 (I update builds roughly every fortnite). I’m running on a 4k display, with 125% Windows Display Scaling, and 125% UI scaling inside Blender. I’m using Left select with new standard Blender hotkey map. Initially, everything seemed to install and work as expected. So at least things are off to a good start. However, I soon confirmed that, I too, am experiencing the same issue reported by Colacuve . Alt-Clicking on a face seems to trigger a loop select that is far offset from where I’m clicking. However, when I move my mouse, it seems to select a different loop. That’s why I’m suspecting maybe the various windows display and UI scaling is part of the issue. However, I can’t really run a 27" 4k display without any upscaling, so hopefully this can be resolved (if, indeed, it’s at all connected). Also, I will quickly add that loop select seems to work if I alt-left click directly on an edge (while in face, edge, or vertex select mode). It only makes strange selections when I alt-click more centrally on a face while in any of the selection modes. Vertex select mode seems to work most reliably, but I guess I’m usually clicking on a specific vertex in that mode. Good luck! This tool is so useful when it’s in full working order! Man thanks for some stellar feedback! I also tested it with the current available build from https://builder.blender.org/download/ I still getting the error message. 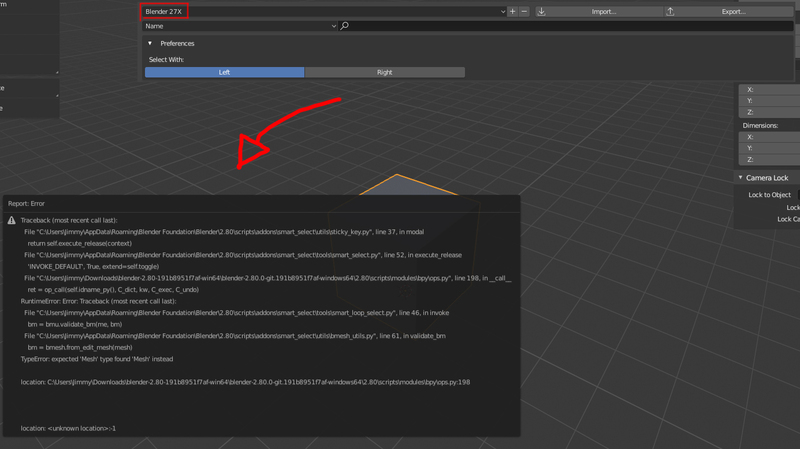 Sounds like this is a bug in the current builds of Blender. You may have to unzip it manually. I can’t seem to make this add on work while in wireframe mode, is there any fix for that? That is probably a new bug since they merged tweak and drag thresholds into one value. Addon has to be updated for current builds.